We still know little about how firms alter their global sourcing patterns when facing uncertainty and shocks. This column uses Japanese firm-level data compiled after the Great East Japan earthquake of 2011 to show that firms in affected areas reacted immediately by offshoring more, but that this affect was significant only in the manufacturing sector. Policies to facilitate offshoring would support such emergency responses in future. Global sourcing by multinational firms has changed international trade. Cross-border transactions of intermediate inputs have increased substantially in recent decades. Hummels et al. (2001) collected data for ten OECD and four emerging market countries that trade in intermediate goods. This trade accounts for about 21% exports from these countries. In a recent study, Johnson and Noguera (2014) use data for 52 countries between 1970 and 2009, and find that international fragmentation had increased by about 10%. The rapid growth of global sourcing has received plenty of attention from academics. Antràs and Helpman (2004) document the importance of contractual frictions in determining firms’ organisation choices. In their theoretical model, they show that firms with higher productivity are more likely to engage in intrafirm trade, that capital- and skill-intensive firms are more likely to have intrafirm trade, and that capital-intensive countries or countries with better institutional quality are more likely to engage in intrafirm trade. The theoretical findings were tested by Tomiura (2007), Corcos et al. (2013), Defever and Toubal (2013), Nunn and Trefler (2013), and others. Antràs and Chor (2013) consider how firms choose their organisational structures when their production required more than one sequential stage. They show that the choice depended on the relationships among production stages, and the location on the production chain. While the determinants of intrafirm trade are becoming apparent, it is difficult to identify their causal effect on international fragmentation. We still know little about how firms alter their global sourcing pattern when facing uncertainty, or negative shocks. To fill this gap, in a recent paper we use the Great East Japan earthquake that occurred on 11 March 2011 as an exogenous shock (Zhu et al. 2016). We study how this negative shock affected global sourcing patterns by using Japanese firm-level data. The earthquake, also known as the 2011 Tohoku earthquake, was the fourth-largest since modern record-keeping began, and was the most powerful earthquake recorded in Japan. Figure 1 shows the areas severely damaged by the earthquake. 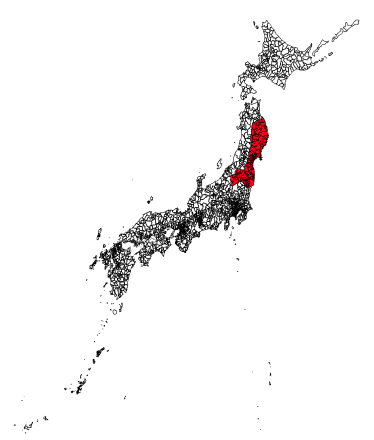 These areas include three Tohoku prefectures: Miyagi, Fukushima, and Iwate. We conduct a difference-in-difference (DD) estimate to study the effect of the earthquake on offshoring activity. We compare firms located in the damaged areas (the treatment group) with those in the unaffected areas (the control group) before and after the earthquake. The main data used came from the Basic Survey of Japanese Business Structure and Activities (BSJBSA), which was conducted by the Ministry of Economy, Trade and Industry in 2010-2013. The surveys covered all firms with more than 50 employees and ¥30 million of assets (about $251,000). The data include the firms’ basic profile (identification number, industry affiliations and firm location) as well as financial and operational information, such as sales, employment, total assets, and offshore activities. This means we can separate global sourcing into manufacturing and service offshoring, in yen values. Our DD estimator shows that the earthquake had a statistically positive effect on firms’ total offshoring. We find that before the earthquake, treatment and control groups showed similar trends. They were not systematically different ex ante, which supports our identifying assumption. We then find that the earthquake shock increased total offshoring by 2.3% on average. As the earthquake happened in 2011, and our sample period is from 2010 to 2013, the DD estimate captures the average treatment effect over three years. Hence, the 2.3% increase of firm’s total offshoring can be translated into an annual increase of 0.8%. How did different types of firms change the composition of offshoring after the earthquake? We decompose the total into manufacturing and service offshoring, and find that the positive earthquake effect was only statistically significant in manufacturing. It is possible that for multi-plant firms, some plants located in the Tohoku area were affected by the earthquake while others were not. This may have caused bias in our estimation results. To rule this out, we restrict the sample to single-plant firms and did another estimation for total, manufacturing, and service offshoring. We find that our results for manufacturing offshoring are robust. We also find there was a significantly positive effect on manufacturing offshoring in 2011, indicating that the effect of the earthquake was a one-off, and that firms adjusted their offshoring activities immediately after the earthquake. We study whether or not the earthquake affected domestic sourcing as a way to investigate whether the positive effect on offshoring was due to the disruption of domestic networks. The effect on domestic sourcing is insignificant. This indicates that the positive effect on offshoring could not be explained by changes in domestic sourcing. Our analysis shows different effects on manufacturing and service offshoring. It is possible that the intermediate goods used in the manufacturing and service sectors were different. When conducting outsourcing, manufacturing firms are required to transport physical intermediate goods using contractors. The damaged transport networks in the Tohoku area may have driven some manufacturing firms to switch from domestic to foreign contractors. Production costs in Japan continue to rise, manufacturing technology in other countries continued to improve, so offshoring by Japanese manufacturing firms will steadily increase. The one-off effect of this earthquake implies that manufacturing firms located in Japan might also increase offshoring as an immediate response to the frequent earthquakes that occur in the region. Policies to facilitate offshoring, such as tariff reductions on intermediate goods and support for the legal system in developing countries, will support these emergency responses. Antràs, P and D Chor, (2013) “Organizing the global value chain,” Econometrica, 81(6), 2127-2204. Antràs, P and E Helpman, (2004) “Global sourcing,” Journal of Political Economy. 112(3), 552-580. Corcos, G, D M Irac, G Mion and T Verdier, (2013) “The determinants of intrafirm trade: evidence from French firms,” Review of Economics and Statistics, 95(3), 825-838. Hummels, D, J Ishii and K-M Yi (2001) “The nature and growth of vertical specialization in world trade,” Journal of International Economics, 54(1), 75-96. Johnson, R C and G Noguera (2014) “A portrait of trade in value added over four decades,” Working Paper. Tomiura, E (2007) “Foreign outsourcing, exporting, and FDI: a productivity comparison at the firm level,” Journal of International Economics. 72(1), 113-127. Zhu, L, K Ito and E Tomiura, (2016) “Global Sourcing in the Wake of Disaster: Evidence from the Great East Japan Earthquake,” RIETI Discussion Paper Series, 16-E-089.